P. Muthumanickam, K. Vrotsou, A. Nordman, J. Johansson, M. Cooper. Identification of Temporally Varying Areas of Interest in Long Duration Eye Tracking Data Sets. IEEE VAST (TVCG track), 2018. Kahin Akram Hassan, Jimmy Johansson, Camilla Forsell, Matthew Cooper, Niklas Rönnberg. On the Use of Parallel Coordinates for Temporal Multivariate Data. IEEE VIS, Infovis Posters, 2017. Jimmy Johansson, Tomasz Opach, Erik Glaas, Tina-Simone Neset, Carlo Navarra, Björn-Ola Linnér and Jan Ketil Rød. 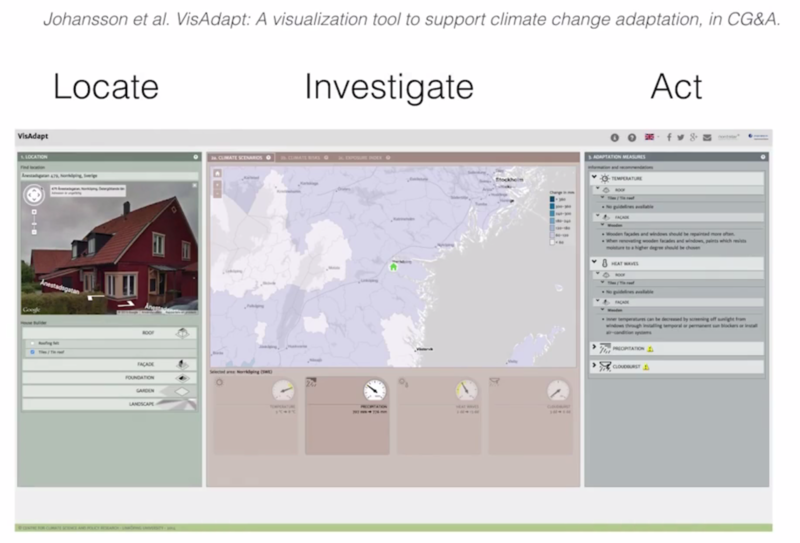 VisAdapt: A Visualization Tool to Support Climate Change Adaptation. Computer Graphics & Applications, 37(2), pages 54-65, 2016. Invited for presentation at IEEE VIS, 2017, (Pdf). Erik Glaas, Mattias Hjerpe, Tina-Simone Neset, Sofie Storbjörk and Jimmy Johansson. Visualizing Urban Climate Change Transition Processes: Identifying Indicators, Assessment Methods and Visualization Techniques. Proceedings Urban Transitions Global Summit. 2016. Jimmy Johansson, Tomasz Opach, Erik Glaas, Tina-Simone Neset, Carlo Navarra, Björn-Ola Linnér and Jan Ketil Rød. VisAdapt: A Visualization Tool to Support Climate Change Adaptation. Computer Graphics & Applications, 37(2), pages 54-65. 2016, Pdf. Prithiviraj Muthumanickam, Katerina Vrotsou, Matthew Cooper and Jimmy Johansson. Shape Grammar Extraction for Efficient Query-by-Sketch Pattern Matching in Long Time Series. IEEE VAST, pages 121-130. 2016, Pdf. Tina-Simone Neset, Erik Glaas, Anne Gammelgaard Ballantyne, Björn-Ola Linnér, Tomasz Opach, Carlo Navarra, Jimmy Johansson, Anna Bohman, Jan Ketil Rød and Michael Goodsite. Climate change effects at your doorstep: Geographic visualization to support Nordic homeowners in adapting to climate change. Applied Geography, Vol. 74, pages 65-72, 2016. Prithiviraj K. Muthumanickam, Katerina Vrotsou, Camilla Forsell, Jimmy Johansson and Matt Cooper. Supporting Exploration of Eye Tracking Data: Identifying Changing Behaviour Over Long Durations. Beyond Time And Errors: Novel Evaluation Methods For Visualization (BELIV), pages 70-77, 2016, Pdf. Niklas Rönnberg, Gustav Hallström, Tobias Erlandsson and Jimmy Johansson. Interactive Sonification for Visual Dense Data Display. Interactive Sonification Workshop, pages 63-67, 2016, Pdf. Niklas Rönnberg, Gustav Hallström, Tobias Erlandsson and Jimmy Johansson. Sonification Support for Information Visualization Dense Data Displays. IEEE VIS Infovis Posters, 2016, Pdf. Kahin Akram Hassan, Niklas Rönnberg, Camilla Forsell and Jimmy Johansson. On the Performance of Stereoscopic Versus Monoscopic 3D Parallel Coordinates. IEEE VIS, Infovis Posters, 2016. Pdf. Linnéa Stenliden, Jimmy Johansson, Jörgen Nissen. Visual Data and K 12 Students-Translations Through Visual Analytics and Knowledge Visualization. 8th International Conference of Education, Research and Innovation, 2015. Jonas Lundberg, Åsa Svensson, Billy Josefsson and Jimmy Johanson. Human-automation collaboration strategies. SESAR Innovation Days 2015. (pdf). Jimmy Johansson and Camilla Forsell. Evaluation of Parallel Coordinates: Overview, Categorization, and Guidelines for Future Research. In IEEE Transactions on Visualization and Computer Graphics 22(1), pages 579-588, 2016 (pdf). Prithiviraj K. Muthumanickam, Katerina Vrotsou, Matthew Cooper and Jimmy Johansson. SMART Series: Sketch-based Matching through Approximated Ratios in Time Series. Poster Proceedings, VIS2015, 2015 (pdf). Erik Glaas, Anne Gammelgaard Ballantynea, Tina-Simone Neset, Björn-Ola Linnér, Carlo Navarra, Jimmy Johansson, Tomasz Opach, Jan Ketil Rød, Michael E. Goodsite. Facilitating climate change adaptation through communication: Insights from the development of a visualization tool. In Energy Research and Social Science, Volume 10, pages 578-61, 2015. Tina Neset, Tomasz Opach, Anna Lilja, Peter Lion and Jimmy Johansson. Map-Based Web Tools Supporting Climate Change Adaptation. In Professional Geographer, pages 103--114, 2015. Daniel Johansson, Karljohan Palmerius and Jimmy Johansson. Visualisering av beslutsstöd för krishantering. Myndigheten för Samhällsskydd och Beredskap (MSB), 2014. Ebad Banissi, Francis T Marchese, Camilla Forsell and Jimmy Johansson (editors). Information Visualisation: Techniques, Usability and Evaluation. Cambridge Scholars Publishing, 2014. Jimmy Johansson, Carlo Navarra, Tina Neset, Erik Glaas, Tomasz Opach and Björn-Ola Linnéa. VisAdapt-Increasing Nordic Houseowners' Adaptive Capacity to Climate Change. Poster proceedings, IEEE Vis2014, 2014 (pdf). Jonas Lundberg, Jimmy Johansson, Camilla Forsell and Billy Josefsson. The Use of Conflict Detection Tools in Air Traffic Management-an Unobtrusive Eye Tracking Field Experiment During Controller Competence Assurance. In the proceedings of the International Conference on Human-Computer Interaction in Aerospace, 2014. Jimmy Johansson, Camilla Forsell and Matthew Cooper. On the Usability of 3D Display in Parallel Coordinates: Evaluating the Efficiency of Identifying 2D Relationships. Information Visualization Journal, vol 13, issue 1, 2014 (pdf). Tomasz Opach, Jimmy Johansson and Jan Ketil Rød. Using Sparklines to Reveal Trends in Parallel Coordinates. Poster proceedings, IEEE Vis2013, 2013. Jonas Lundberg, Camilla Forsell, Jimmy Johansson, Billy Josefsson. Förstärkt Samarbete Med Automation. Poster proceedings, Human Factors Network in Sweden, 2013. Ebad Banissi, Stefan Bertschi, Camilla Forsell, Jimmy Johansson, Sarah Kenderdine, Francis T. Marchese, Muhammad Sarfraz, Liz Stuart, Anna Ursyn, Theodor G. Wyeld, Hanane Azzag, Mustapha Lebba, and Gilles Venturini (editors). Information Visualization, IV13. Jimmy Johansson, Katerina Vrotsou, Fredrik Borgsjö and Inger Erlander Klein. Demola East Sweden-Multidisciplinära industriprojekt som främjar innovation. 4:e Utvecklingskonferensen för Sveriges ingenjörsutbildningar, 2013. Sara Johansson Fernstad, Jane Shaw and Jimmy Johansson. Quality Based Guidance for Exploratory Dimensionality Reduction. Information Visualization Journal, vol. 12 nr. 1, 2013 (pdf). Jimmy Johansson, Morten Andersen, Alexander Fridlund and Mikael Hoffmann, Interactive Visualization of Prescriptions of Drugs to Individuals within Large Populations-Analyses of Temporal Relationships of Events. In Proceedings of 2012 Workshop on Visual Analytics in Healthcare, 2012 (pdf). Ebad Banissi, Stefan Bertschi, Camilla Forsell, Jimmy Johansson, Sarah Kenderdine, Francis T. Marchese, Muhammad Sarfraz, Liz Stuart, Anna Ursyn, Theodor G. Wyeld, Hanane Azzag, Mustapha Lebba, and Gilles Venturini (editors). Information Visualization, IV12. Christian Tominski, Camilla Forsell and Jimmy Johansson. Interaction Support for Visual Comparison Inspired by Natural Behavior. IEEE Transactions on Visualization and Computer Graphics, Vol. 18, No. 12, 2012. Christine Mikkelsen, Jimmy Johansson and Matthew Cooper. Visualization of Power System Data on Situation Overview Displays. In proceedings of the the 16th IEEE International Conference on Information Visualization, IV12, pages 188-197, 2012 (pdf). Ebad Banissi, Stefan Bertschi, Remo Burkhard, Urska Cvek, Martin Eppler, Camilla Forsell, Georges Grinstein, Jimmy Johansson, Sarah Kenderdine, Francis T. Marchese, Carsten Maple, Marjan Trutschl, Muhammad Sarfraz, Liz Stuart, Anna Ursyn, and Theodor G. Wyeld. (editors). Information Visualization, IV11. Sara Johansson Fernstad, Jimmy Johansson, Suzi Adams, Jane Shaw and David Taylor. Visual Exploration of Microbial Populations. In proceedings of the 1st IEEE Symposium on Biological Data Visualization (BioVis), pages 127-134, 2011 (pdf). Christine Mikkelsen, Jimmy Johansson and Mikko Rissanen. Interactive Information Visualization for Sensemaking in Power Grid Supervisory Control Systems. In proceedings of the 15th IEEE International Conference on Information Visualization, IV11, pages 119-126, 2011 (pdf). Sara Johansson Fernstad and Jimmy Johansson. A Task Based Performance Evaluation of Visualization Approaches for Categorical Data Analysis. In proceedings of the 15th IEEE International Conference on Information Visualization, IV11, pages 80-89, 2011 (pdf). Patrik Lundblad, Hanna Löfving, Annika Elovsson and Jimmy Johansson. Exploratory Visualization for Weather Data Verification. In proceedings of the 15th IEEE International Conference on Information Visualization, IV11, pages 306-313, 2011 (pdf). Kai Puolamäki, Alessio Bertone, Roberto Theron, Otto Huisman, Jimmy Johansson, Silvia Miksch, Panagiotis Papapetrou and Salvo Rinzivillo. Data Mining (Book chapter). Mastering The Information Age - Solving Problems with Visual Analytics, Eurographics Association, 2010. Ebad Banissi, Stefan Bertschi, Remo Burkhard, John Counsell, Mohammad Dastbaz, Martin Eppler, Camilla Forsell, Georges Grinstein, Jimmy Johansson, Mikael Jern, Farzad Khosrowshahi, Francis T. Marchese, Carsten Maple, Richard, Laing, Urska Cvek, Marjan Trutschl, Muhammad Sarfraz, Lis Stuart, Anna Ursyn, and Theodor G. Wyeld (editors). Information Visualization, IV10. Jimmy Johansson, Tina Schmid Neset and Björn-Ola Linnér. Evaluating Climate Visualization: An Information Visualization Approach. In proceedings of the 14th IEEE International Conference on Information Visualization, IV10, pages 156-161, 2010 (pdf). Camilla Forsell and Jimmy Johansson. An Heuristic Set for Evaluation in Information Visualization. In proceedings of Advanced Visual Interfaces, 2010. Tina Schmid Neset, Victoria Wibeck, Ola Uhrqvist and Jimmy Johansson. Visualizing Climate Change: the Potential of Dome Presentations as a Tool for Climate Communication. In proceedings of Eurographics, 2010, Norrköping, Sweden. Sara Johansson and Jimmy Johansson. Visual Analysis of Mixed Data Sets Using Interactive Quantification. SIGKDD Explorations Special Issue on Visual Analytics and Knowledge Discovery, volume 11, issue 2, pages 29-38, 2009 (pdf). Tina Schmid Neset, Jimmy Johansson and Björn-Ola Linnér (editors). The State of Climate Visualization. CSPR Report Series,Linköping University 2009. Sara Johansson and Jimmy Johansson. Interactive Dimensionality Reduction Through User-defined Combinations of Quality Metrics. IEEE Transactions on Visualization and Computer Graphics (IEEE Infovis), volume 15, number 6, pages 993-1000, 2009. (pdf). Katerina Vrotsou, Jimmy Johansson and Matthew Coooper. ActiviTree: Interactive Visual Exploration of Sequences in Event-Based Data Using Graph Similarity. IEEE Transactions on Visualization and Computer Graphics (IEEE Infovis), volume 15, number 6, pages 945-952, 2009. (pdf). Ebad Banissi, Liz Stuart, Theodor G Wyeld, Mikael Jern, Gennady Andrienko, Nasrullah Memon, Reda Alhajj, Remo Aslak Burkhard, Georges Grinstein, Dennis Groth, Anna Ursyn, Jimmy Johansson, Camilla Forsell, Urska Cvek, Marjan Trutschl, Francis T. Marchese, Carsten Maple, Andrew J. Cowell and Andrew Vande Moere (editors). Information Visualization, IV09. Sara Johansson, Kristina Knaving, Amanda Lane, Mikael Jern and Jimmy Johansson. Interactive Exploration of Ingredient Mixtures Using Multiple Coordinated Views. In the Proceedings of the 13th IEEE International Conference on Information Visualisation, IV09, pages 210-218. Jimmy Johansson and Matthew Cooper. A Screen Space Quality Method for Data Abstraction. Computer Graphics Forum, volume 27, number 3, pages 1039-1046, 2008 (pdf). Jimmy Johansson, Camilla Forsell, Mats Lind and Matthew Cooper. Perceiving Patterns in Parallel Coordinates: Determining Thresholds for Identification of Relationships. Information Visualization, volume 7, number 2, 2008, pages 152-162. (pdf). Jimmy Johansson. Efficient Information Visualization of Multivariate and Time-Varying Data, PhD thesis, Linköping University, Sweden, 2008 (link). Thesis was defended May 30th. Opponent: Professor Helwig Hauser, University of Bergen, Norway. Sara Johansson, Mikael Jern and Jimmy Johansson. Interactive Quantification of Categorical Variables in Mixed Data Sets.Proceedings of IEEE International Conference on Information Visualisation, IV08, pages 3-10, 2008 (pdf). Mikael Jern, Sara Johansson, Jimmy Johansson and Johan Franzén. The GAV Toolkit for Multiple Linked Views. In Proceedings of the Fifth IEEE International Conference on Coordinated & Multiple Views in Exploratory Visualization, pages 85-97, 2007. Jimmy Johansson, Patric Ljung and Matthew Cooper. Depth Cues and Density in Temporal Parallel Coordinates. In Proceedings of Eurographics/IEEE-VGTC Symposium on Visualization, 35-42, 2007 (pdf). Camilla Forsell and Jimmy Johansson. Task-Based Evaluation of Multi-Relational 3D and Standard 2D Parallel Coordinates. In Proceedings of SPIE-IS & T Electronic Imaging, SPIE, Vol.6495, 64950C-1-12, 2007 (pdf). Jimmy Johansson, Patric Ljung, Mikael Jern and Matthew Cooper. Revealing Structure in Visualizations of Dense 2D and 3D Parallel Coordinates. Information Visualization, volume 5, number number 2, pages 125-136, 2006 (pdf). Jimmy Johansson, Patric Ljung, Mikael Jern and Matthew Cooper. Revealing Structure within Clustered Parallel Coordinates Displays. In proceedings of the 11th IEEE Symposium on Information Visualization, pages 125-132, 2005 (pdf). Jimmy Johansson, Matthew Cooper and Mikael Jern. 3-Dimensional Display for Clustered Multi-Relational Parallel Coordinates. In Proceedings of the 9th IEEE International Conference on Information Visualisation, pages 188-193, 2005 (pdf). Daniel Ericson, Jimmy Johansson and Matthew Cooper. Visual Data Analysis using Tracked Statistical Measures within Parallel Coordinate Representations. In Proceedings of the 3rd IEEE International Conference on Coordinated & Multiple Views in Exploratory Visualization, pages 42-53, 2005 (pdf). Nina Feldt, Henrik Pettersson, Jimmy Johansson and Mikael Jern. Tailor-made Exploratory Visualization for Statistics Sweden. In Proceedings of the 3rd IEEE International Conference on Coordinated & Multiple Views in Exploratory Visualization, pages 133-142, 2005. Jimmy Johansson, David Lindgren, Matthew Cooper and Lennart Ljung. Interactive Visualization as a Tool for Analysing Time-Varying and Non-Linear Systems. In Proceedings of the 16th IFAC World Congress, pages Tu-E03-TP/8, 2005. Jimmy Johansson, Patric Ljung, David Lindgren, Matthew Cooper. Interactive Poster: Interactive Visualization approaches to the Analysis of System Identification Data. In Poster Proceedings Compendium, 10th IEEE Symposium on Information Visualization, pages 23-24, 2004. Jimmy Johansson, Mattias Jansson, Robert Treloar and Mikael Jern. Visual Analysis based on Algorithmic Classification. In Proceedings of the 7th IEEE International Conference on Information Visualisation, IV03, pages 86-93, 2003. Jimmy Johansson and Mattias Jansson.Interactive Visualization of Statistical Data using Multidimensional Scaling Techniques, Master Thesis. Linköping University. 2003.